The Collaborative Economy Resilient Summit: Who Should Attend and Why? 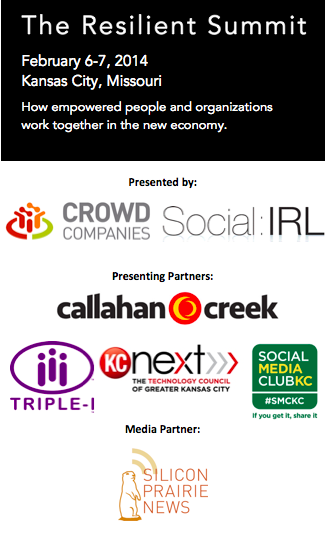 In February 2014, Social: IRL principal Ben Smith and Crowd Companies founder Jeremiah Owyang, will co-host The Resilient Summit – a two-day conference exploring key issues surrounding the collaborative economy. The summit will take place in Kansas City, with participants ranging from major global brands, financial institutions, and marketing agencies, to leaders in the maker and sharing movements, tech startups, small businesses, city leaders, and civic organizations. Attendees are registered from across the United States as well as Canada and Europe. The implications of the collaborative economy are far-reaching and we invite you to join us for a unique opportunity to gain insights on this critical topic from Jeremiah and other industry leaders, and to go beyond typical keynote presentations to a highly engaged conversation focused on asking and answering some of the most difficult questions, and together developing actionable insights. Businesses – What role to businesses play when people get what they need from each other? Find out how businesses must enable these new behaviors. Startups – Who’s the next Uber, Etsy, Airbnb, or Kickstarter? Come explore how these scalable new business models are growing faster than ever. City Governments and Civic Organizations – Using new technologies, find out how cities and governments can increase resiliency, and reduce waste by igniting the sharing community in your own city. Makers and Sharers – Calling all revolutionaries! Come join you breathren as we redesign and reshape the economy in a way that helps the people. Marketing Agencies – What’s the next phase after social media? Come learn how the sharing economy and maker movement ignite new influencers in the physical world. Social Media Pros and Community Managers – The first phase of sharing is when people created media and shared it, we call this social media. Now people are creating physical products and sharing them, understand how to tap into the powerful Collaborative Economy movement. Entrepreneurs & Innovators – Find out why Google, VCs and other powerful investors have double-downed into the sharing economy and online marketplaces. Find out the latest tech trends at this first-of-a-kind Summit. Small Business – Connect to your community as the local level as people share, make and develop community using new technologies.